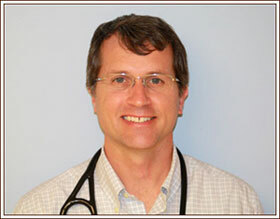 Home >> Our Providers >> Eric Jones, M.D. Dr. Eric is native to Charleston, WV. He received an undergraduate degree in chemistry from the University of Virginia and attended the Marshall University Medical School. He completed his pediatric residency at the Columbus Children's Hospital/Ohio State University. He is board certified in pediatrics and is a fellow in the American Academy of Pediatrics. His special interests are caring for multiples (twins, triplets, etc.) and former premature infants. Dr. Jones met his wife (Dr. Sharmila) in medical school, and they have worked together since. They have four wonderful children who always keep them running. Dr. Eric enjoys skiing, biking, water sports and most any other outdoor activity he can share with his family. Dr. Jones is currently not accepting new patients. Limiting new patients from time to time helps us to better serve our existing pediatric patients and their medical needs. If you have any questions, please feel free to call the office at 304 982-7031.